There is a serious fury on the horizon descending from Biafrans all over the world against the arch-genocidist of Nigeria called Gen Yakubu Gowon of shame who swam in the blood of Biafran civilians from 1966 to 1970. The fury of Biafrans worldwide is caused by the infamous and mischievous statement made by this arch-genocidist known as Gen Yakubu Gowon in a television interview on Wednesday, 25th October 2017. He described Gen Odumegwu Ojukwu as a liar who renegade in the Aburi Accord when it was obvious that it was Gen Yakubu Gowon that made mockery of the Aburi accord which would have saved the lives of millions of Biafrans. Gen Yakubu Gowon and his northern brothers in the Nigerian military wasted their lives from July 6, 1967 to January 12, 1970. 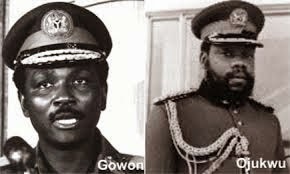 In the interview, Gen Gowon, the war criminal was trying to paint himself as a righteous man and Gen Ojukwu, whom he, Gowon declared war against his people, as the offender. It is unfortunate that because history was removed from the Nigerian school curriculum, anybody can easily open his mouth and twist history to suit his or her own obnoxious desire while speaking to the younger generation of Nigeria bereft of history. Gen Yakubu Gowon, the world biggest genocidist of the century is not to be completely blamed for twisting history while talking in front of the journalists who should have been aware of the position of history but all the blame should be given to the Nigerian School system where those half-baked journalists interviewing Gen Gowon were all starved of history in the Primary, Secondary and even the tertiary institutions where they all attended. Gen Gowon is only exploring the bad condition which the removal of the history curriculum in Nigerian schools created in the psyche of the gullible younger generation of Nigerians including the half-baked journalists interviewing him. It is important for the world to know that Gen Gowon in his desire to waste the blood of Biafrans renegade from an agreement entered with Gen Ojukwu in the presence of the world in Aburi Ghana commonly referred to as “ABURI ACCORD” where Gen Gowon representing Nigeria and Gen Ojukwu representing Eastern Nigeria (later Biafra) agreed to retain Nigeria as a Confederation of regions instead of making it unitary government as Gen Gowon kept it after his bloody coup where he assassinated Gen Aguiyi Ironsi. But Gen Gowon who also signed the agreement for Nigeria failed to keep it. He came back from Ghana and instead of issuing the decree which would return power to regional governments which he had then usurped for about six months of his reign from July 1966 when he assassinated Gen Aguiyi Ironsi in a bloody military coup and pogrom against Biafra civilians to that January 1967 when Aburi accord took place, he rather made mockery of the agreement by retaining the unitary structure of Nigeria which he created and consummated the mockery by splitting the unitary Federal Nigeria to 12 States on May 1967 without consulting the governors of the regions.